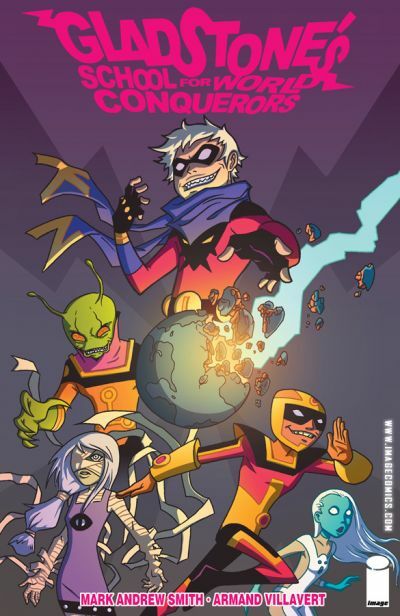 Berkeley, CA â€“ 28 October 2011 â€“ The most villainous clique of kids in all of comics will be graduating to a trade paperback volume of GLADSTONE’S SCHOOL FOR WORLD CONQUERORS from Image Comics this November. Originally solicited at a lower page count, once the first 6 issues of this critically acclaimed series were tallied up, the collection clocked in at nearly 200 pages! Mark Andrew Smith, writer of AMAZING JOY BUZZARDS, the two-time Harvey nominated THE NEW BRIGHTON ARCHEOLOGICAL SOCIETY, and editor for the Eisner-winning POPGUN anthology, has devised a dastardly plot to make wicked children the stars of the show in GLADSTONE’S SCHOOL OF WORLD CONQUERORS. And with the help of Armand Villavert’s artistic mastermind, the nefarious youths of this series are deftly brought to the page, larger than life and disarmingly adorable! Welcome to Gladstone’s School for World Conquerors, a top-secret academy for the children of the world’s greatest super villains to learn the trade. Join us as Kid Nefarious, Mummy Girl, Martian Jones, Ghost Girl, and the infamous Skull brothers unearth the School’s and their parents’ hidden past! GLADSTONE’S SCHOOL FOR WORLD CONQUERORS, VOL. 1 TP (SEP110407, ISBN: 978-1-60706-115-1), a 192-page full-color all ages supervillain adventure comic book collection for $15.99, will be on sale in stores November 16.